Our first day in Madrid and we are loving it. We’ve been sight seeing all day and have seen a lot, wish Kari was here to translate somethings though! Our flight was OK, very very long. We didn’t sleep much and were exhausted when we finally arrived in Madrid. When we got here we went out to a tapa bar, which serves only appetizer like food… it was really tasty. We met a bunch of other travellers. Today we got up early and have spent the whole day looking around. It is a beautiful city. The Roman influence is beautiful, statues of roman gods all over. We went to the Museo de Prado which was gorgeous. One of the largest art museums in the world. There were some pretty interesting exhibits. We also took a bus tour around the city. It’s huge, over three times the population of Calgary! We’re feeling pretty jet lagged, but the delicious Spanish espresso helps (: We head by train to Toledo tomorrow. Maybe pictures in a few days. The other night Sarah and I were talking about how we were going to get from Spain to Italy. Our original idea was to catch a ferry from Barcelona, Spain to Genova, Italy. It seemed expensive but the expense made sense. ¿Usted Habla España Parlate Italiano? Sarah and I have now booked our flights to Europe for this September. Oh man, we are so stoked! We’ve been planning to go on a trip to Europe for quite a while now. I’ve heard about many people trying to mash tonnes of countries into a trip, but I’m proud that we’ve kept our scope for this trip to just Spain and Italy. 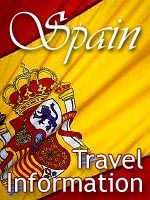 That’s right, we’ve booked a 4 week trip to Italy and Spain for this September. We got a killer deal on flights with Scandanavian Air, $909 plus tax each. This will fly us from Calgary through Copenhagen (Denmark) to Madrid (Spain), and then from Rome (Italy) through Copenhagen back to Calgary. Man it’s gonna be fun! We picked up the Spain Lonely Planet guide at a used book store in Kensington and we are starting to figure out where we want to go and what we want to see. We’ll be looking to pick up a book on Italy too. We’re planning on hosteling and camping it most of the way… we’ve heard there are some pretty cool camping spots. Anyone have other suggestions for us? Don’t be shy. You are currently browsing the archives for the Spain & Italy category.